← The Top 4 Ways To Get Blake Lively’s Legs… Gimme Those Gams! If you can talk on the phone, or send text messages, while your doing your cardio, you’re not working hard enough (and you’re not focused on what you’re there for… to burn calories!). Put the phone down, and get moving! Guess what? 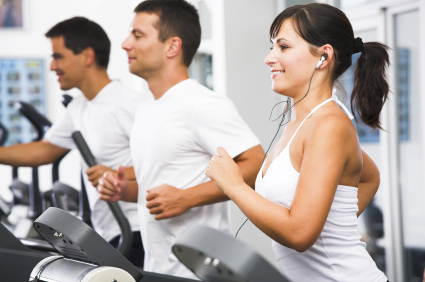 Just because you see some lights flash when you get on your elliptical machine doesn’t mean that the machine is turned on and giving you the appropriate resistance. You usually at least have to press Quick Start to actually start working out… otherwise, you’re just going through the motions. Make sure your machine is working for you rather than against you by setting the resistance to a level that gets your heart range in it’s target range. The worst scenario you could ever imagine at the gym happens way too often… the machine isn’t turned on, and the gal on the machine is sipping a Venti Frapp that has literally 15 times more calories than she’s burning! This tactic is doomed to failure. While it is true that you have to have energy to workout hard, this is not the energy you need. Fruits, veggies, and lean proteins will give you the gumption to go full bore without wasting your time. Don’t forget… it’s not enough to just go to the gym. Make your time count, and look great for this coming bikini season! It’s right around the corner.